We Remember the Kerber Family of Gombin! 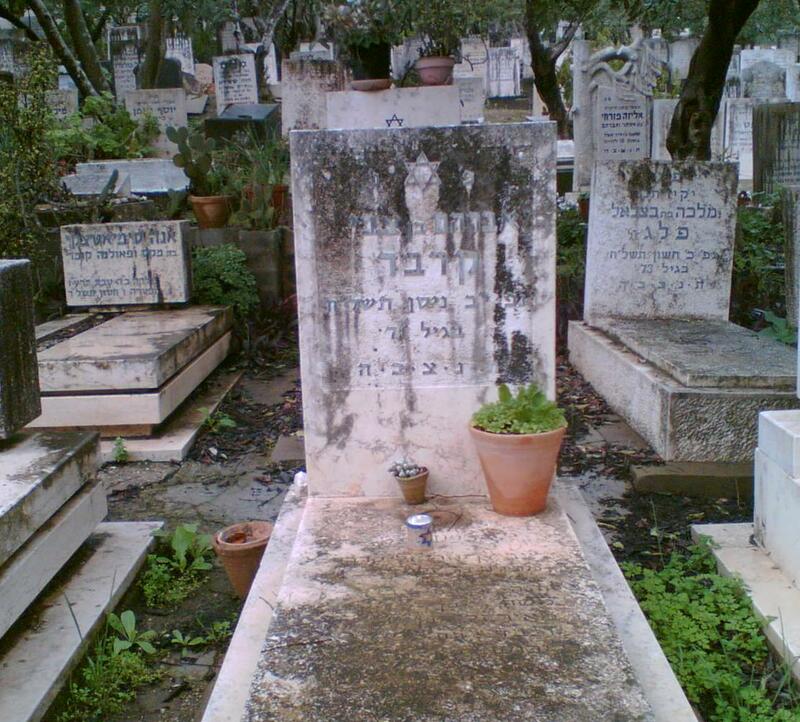 I've located the tombstone of the "photographer dwarf" (as he was known in Kiryat Tivon, according to residents testimony) in the cemetery of Kiryat Tivon, Israel. 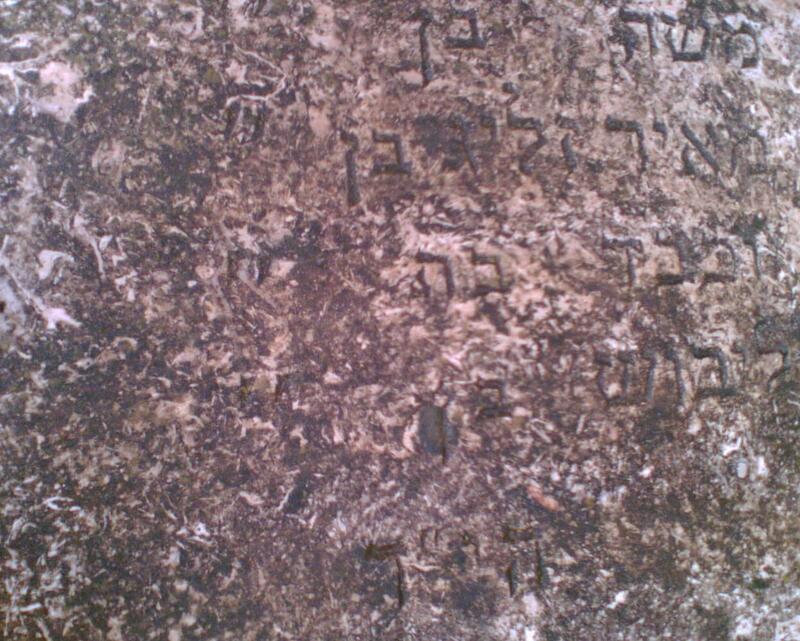 The location of the tombstone: Gush Alef, row 16, nr 38. 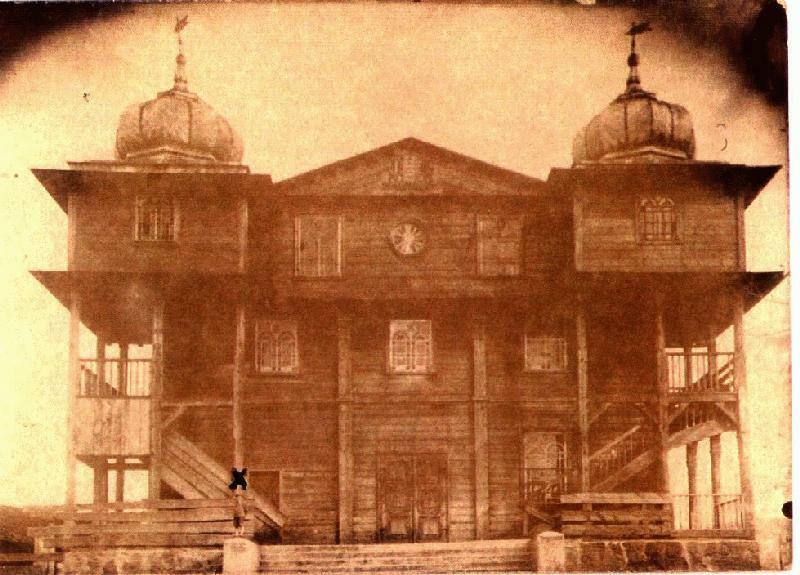 This photograph was on a Rosh Hashana postcard, sent to Abram Chaja, a "Khalutz" (pioneer) in Eretz Israel, by his brother Josek Chaja from Gombin, in 1930. There is the dwarf Umcza Kerber in the photograph. Umcza survived the Holocaust by hiding in cardboard boxes in the railway station of Warsaw... he later immigrated to Israel and lived and died in Tivon. 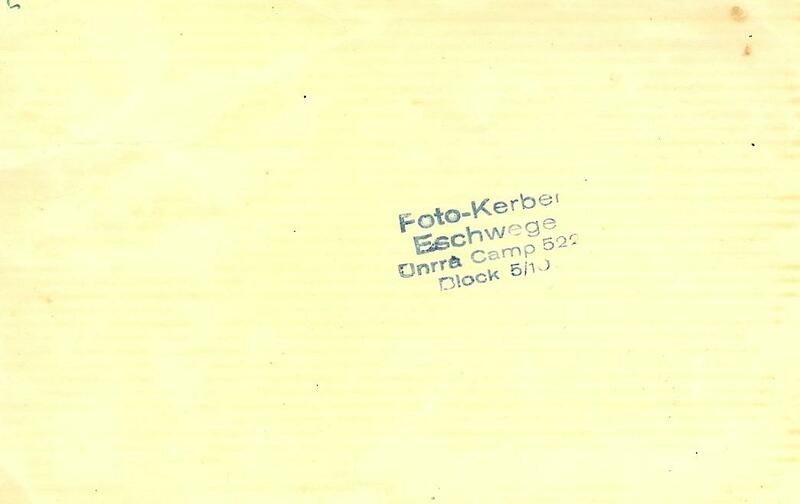 Josek Chaja who send the postcard perished with all his family, his wife Ciril Sannicki, my mother's cousin, and their little child. On Yom Kippur 5700, after only a few days of occupation in September 1939, the Germans burnt this exquisite treasure which survived nearly 250 years. They started with the synagogue and ended with human beings. What can we do now, after more that 50 years, to revenge? We live, we didn't altogether perish, we have a State of our own, we have thousands of synagogues in our flourishing land, but does it bring any comfort? *My mother Rywcia Holcman nee' Gostinska had a first cousin Surcia (Sara) Sanicki, who was married to Moshe Kerber, a brother of Umcza... They had a child. All three perished in Chelmno. 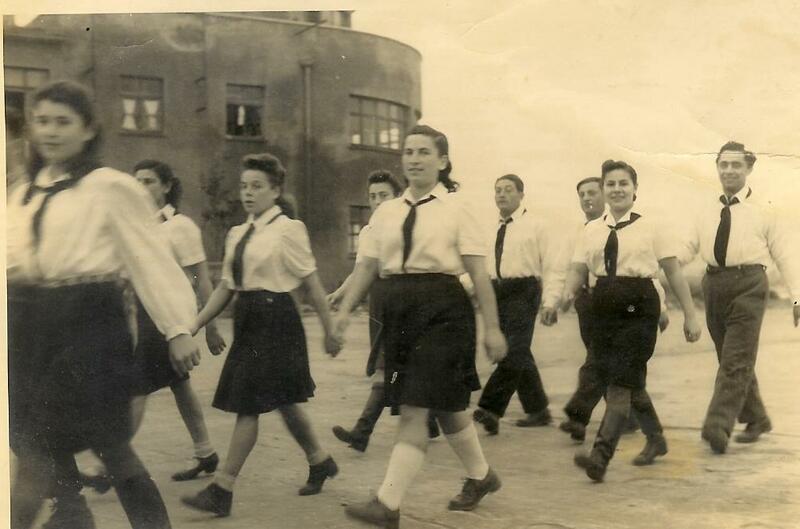 Umcza used to visit us in the Kibbutz when we were little children, back in the 50s. He was a very lonely person, poor man in the deepest meaning of the word. His brother Fajwisz KERBER is in the picture of my late father: the football children group of Gombin.. the end is known... Perished in Holocaust. Umcza's father, Hersz KERBER was shot to death in the firemen hall, during the night of 7-8 March 1942 before the men of Gombin chosen for slavery were taken to the Konin Forced Labour camp. To its side was sited a grand nephew, who survived and witnessed this murder and wrote about it in his testimony to Yad Vashem: Itzhak Weicman, grandson of Leibel KERBER who is still alive in Israel. Umcza survived by hiding in carton boxes in the railway station of Warsaw. This was told to me by my late father, Meir Holtzman. We Remember Umcza KERBER, the lonely dwarf of Gombin! >well it took a long time, but i do believe that i have something you have wanted for a long time. >attached , please find what i believe to be two pictures of the Dwarf of Gombin with my father, Abram. >This first picture is my father and the little guy. >allow and insure that the story can be told at all. Anyone identifies the two other men with Abram Seideman and Umcza Kerber? Charles Seidman thinks they may be Manny Laski and Shmuel Laski of blessed memory. "I knew Umcza Kerber in Gombin since I was 8 years old. 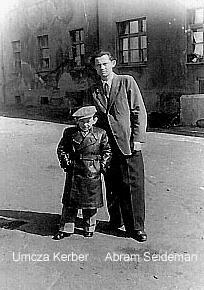 The young brother Leibusz was my good friend (perished in the Holocaust). It was a big family. They lived on the corner of Kutno st. where my parents lived. They had a grocery shop in from of the house. Their neighbor was a rich Volksdeutsche family. This street led through the bridge over the spring which crossed the town to "Nowy Rynek" the new square. Umcza was very intelligent - much above the average. He was a living encyclopedia and you could consult with him nearly on any subject. He was a very generous person, lover of the people. Everybody loved him and respected him. He never walked alone - all the time someone accompanied him because they were afraid that the Poles will hurt him. He was very gifted and had great talent to drawing. He used to do hundreds of those drawings and then specialized in photography. Unfortunately nothing from his heritage survived... They burned people so who would care for drawings or paintings of a Jewish dwarf..."
After he made alyia, he settled down in Kiryat Tivon. He was a gifted photographer in and made a very respectable living until the end. 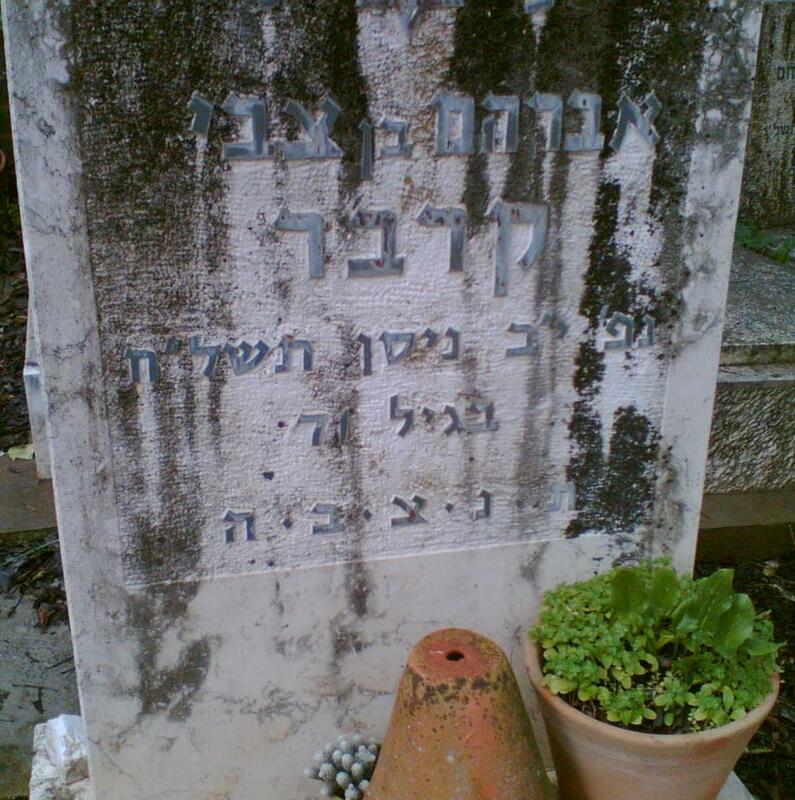 He was a neighbour of Zalman Etinger who was his best friend. 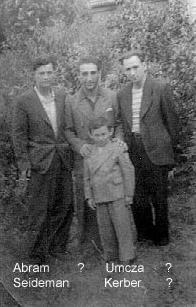 He used to visit Kibbutz Evron from time to time where some Gombiners lived." Zalman is the last of them still alive at the age of 94. Uncza was a living proof that the spirit and art overcome all physical disabilities. Writer of petitions: Kerber C.
I recently received word that I have been selected as a Fulbright Scholar to create the film, “The Lilliput”, from my original script. I plan to film in Lodz, Gombin, and other locations in Poland. I have interviewed several prominent dwarf actors in the U.S., and it is likely that Mark Povinelli, who starred as “Toulouse Lautrec” at Lincoln Center in New York City last year will come to Poland to play the role of Umchzek Kerber. The rest of the cast will be recruited from the drama department of the National Film School and other actors I meet in Poland and Israel. 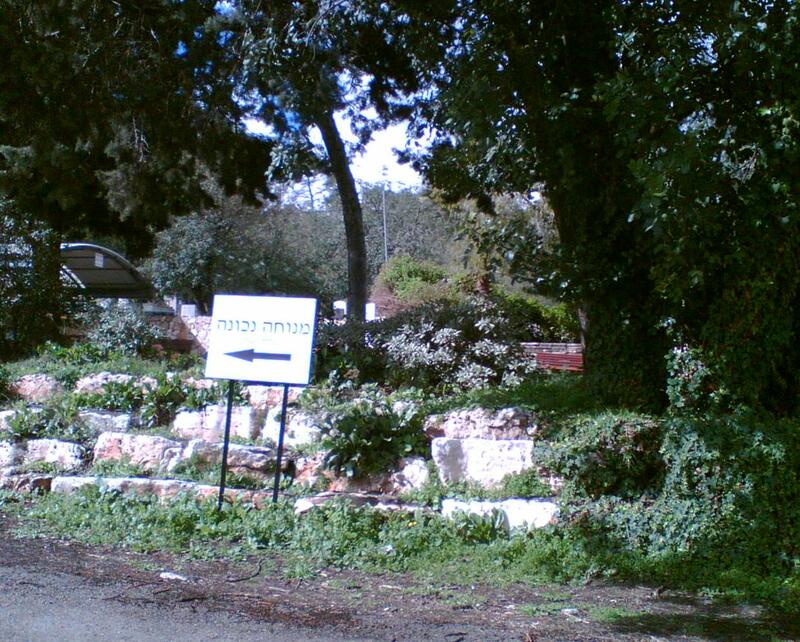 (I am hoping to film in Kibbutz Evron, where many Gombin survivors emigrated). One of the most miraculous stories of survival is that of Umchzek Kerber (born Abraham; “Umchzek” was his nickname) who survived the war, hiding in garbage cans and cartons at the Warsaw railway station for years. Both of my parents knew him, and I used to ask my mother who he was, sitting next to her in an old black and white photograph she kept. 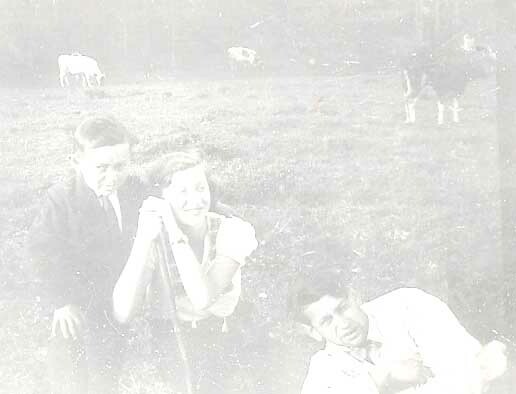 George Zolna and his daughter Ranee Weinstein, sent me a picture recently, of Umchzek and George in “Lodz House” in 1945. The Gombiners referred to Umchzek Kerber as ‘the lilliput’, which means ‘dwarf’, in Polish. I was intrigued about him and found out what I could, although exact details proved elusive. He didn’t marry and had no children, and was the only survivor of his immediate family. He lived in Israel until the 1980’s and was a photographer there, as he had been in Poland before the war. He is remembered visiting Kibbutz Evron in the 1950’s. With the aid of Ada Holtzman, our genealogical expert on all matters Gombin, whose mother, Rywcia, was a cousin of Umchzek's sister in law (Sara Sannicki, wife of Mosze Kerber, both perished, and with the memoir of Izchak Weitzman (which is on Ada’s website), I gathered photographs and wrote my script. Since the script is inspired by the life of Kerber, I have taken the narrative liberty to chart his survival in Gombin at the beginning of the war, and then in Lodz and Warsaw, where he was in hiding. This enabled me to illuminate others Gombiner stories in the script, and include aspects of the ghettos in Lodz and Warsaw, and the numerous train transports from those cities to Chelmno, Auschwitz and Treblinka. The video companion, which I will shoot during our stay in Poland, will focus on the experiences and narrative of my 16 year old daughter, Mimi, who will be with me during the entire ten months. As an American grandchild of Holocaust survivors from this place, her video diary will be directed to the MTV generation audience. Overcoming this generational gap in knowledge of the Holocaust to the 3rd generation, is a struggle that this video aims to over-come, by embracing a style that is intimate and welcome to teenage viewers. Fundraising for the film will continue in the U.S. and Europe, with the capable assistance of my assistant director, Eduardo Vilchez. Eduardo and New Jersey City University will assist by contributing to the costs of financing his participation on this. Eduardo is helping to create a website that will have a fundraising button for individual donations. An independent filmmaker website, www.IndieGoGo.com will be featuring our film for individual donations from the filmmaker community. The Gombin Society is providing a grant of $10,000 toward the project. 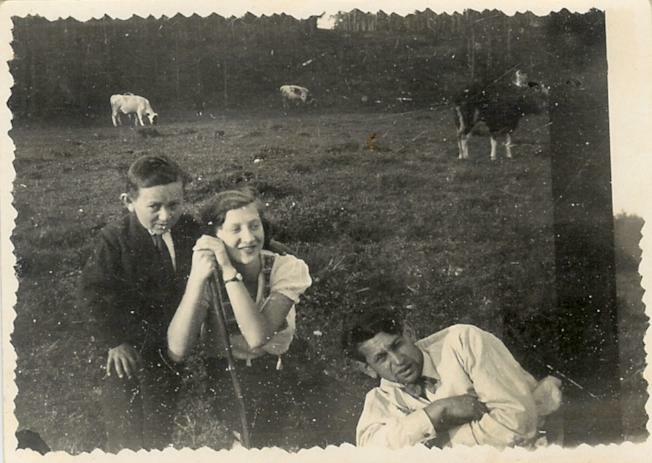 In kind donations include housing accommodations from the University of Lodz for the duration of the Fulbright, and accommodations in Israel are provided by Gombiner granddaughter, Joyce Boll, who is a producer in Tel Aviv. The National Film School of Lodz, will provide technical support. For further information, please contact the filmmaker at 201-993-8264 cell or email minna.packer "at" gmail.com (replace "at" by "@" to avois spam). The webpage for “The Lilliput” is www.myspace.com/theliliput. I'm a child of Holocaust survivors that hates to ask for anything. Yet as an independent American filmmaker on a mission, I find myself in the position of holding my hand out, simply because I was not born in a place where "state" funded films are supported and made. My beloved country is a place where an artist such as myself, must prove their worth to the masses, one at a time. There are no easy hand outs for independent American filmmakers. For a Jewish American filmmaker producing a movie about a Jewish dwarf who survives the Holocaust, and how his survival impacts on future generations, it is an uphill climb. My role as a filmmaker telling the story of what happened to our people requires assistance of all kinds. I am working with many talented people, cast and crew, from many different faiths, and international addresses. A diverse group will bring this story to life on film, and many of them are young. Because of their youth, they are even more removed from the history that influenced me. Still they too are touched by it, and bring their best work to help make this film happen. I was not born with a silver spoon in my mouth. My last name is not Spielberg. I am simply a Jewish child of survivors, whose father had the mixed blessing of surviving a certain hell. I am one of the "bridge" generation. That means that it is my mission to bridge the history of the past into the present, and forward it to the future generations, lest they not forget. I do this with film and a mouth that is sometimes accused of being too vocal about these matters, regarding our shared history and those we descend from. Filmmaking is an expensive undertaking, but is one of the most poignant tools an artist and a person of conscience has in thier tool box, to reach many people with ideas, emotions and important content. Therefore, I ask that you read the pitch below for The Lilliput movie fundraiser on the www.IndieGOGO.com website, and give as generously as you can, to help get this film made. If you know others who are in a position to help and wish to, please pass this email on to them! If anyone wishes to speak to me directly about helping, my email is minna.packer "at" gmail.com (replace "at" by "@" to avois spam). Page originally posted in December 1999!